DataLife Engine is a news cursor popular in a RuNet. Zebroid has the maximum support of this CMS (import of a content from a site in the program, export from the program on a site, and as support of comments). The first type is convenient that it is not necessary to come in admin panel of a site, and the second that process of export passes much faster (especially on the big projects). Besides, at use of file export there is a possibility to start <a href="/documentation/export/export-and-upload/> Export and pouring , for this CMS, and it means what to enter in админку as not necessarily. Absence of support of comments is a minus of use XML-RPC-. For work of both types of export on a site the corresponding module should be established. 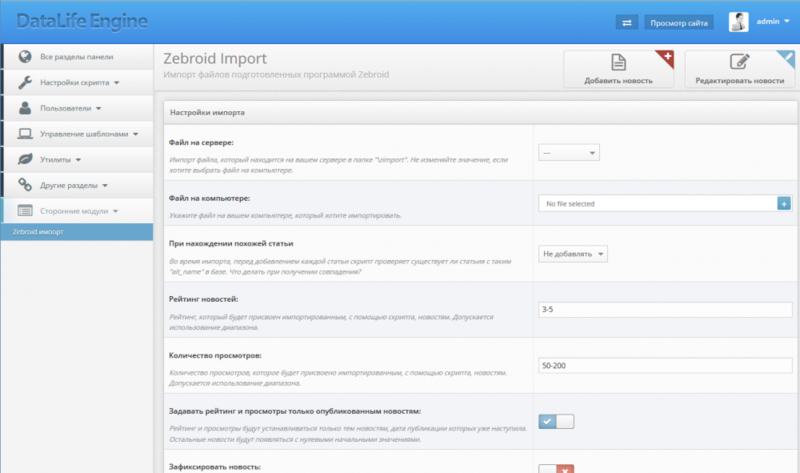 The first high-grade module of posting in DLE under report XML-RPC is created specially for users of program Zebroid. The module is able to create categories, posts, static pages, to edit them, to delete, fill in pictures on the server, in general practically everything that similar module WordPress is able. It is necessary as to know that мета the information is not transferred under this report and labels, the description and title is formed by means DLE. At present there are 2 modules which work with files cгенерированными program Zebroid. They differ possibilities, in the speed of work and compatibility with different versions of program Zebroid. To choose them it is necessary proceeding from what version Zebroid is used by you. Further under the text it will be a question of more advanced and functional version of the module which is compatible with Zebroid versions 4.6.2 and above. The old version модулья for the previous versions of Zebroid it is possible to find in the section end. After module installation come in the Control panel-> Foreign modules-> Zebroid Import and can start to use. Specially for users Zebroid the module for CMS DLE which does possible has been written to display only those comments which date of the publication has come. The given module works on DLE versions 9.0 and above. It is recommended to use with Zebroid versions 4.6.2 and above. The module watches that the comments which date has not come, were not displayed on a site. A principle very simple:the script is started with some interval and to all posts which date of the publication has come — puts the status «Approved», and that has not come yet — «Expecting». Thus on a site those comments which date has already come are displayed only. Possibility should be accessible to module work on your server to add the task in cron. Pass in the administrator the module panel (the Control panel-> Foreign modules-> zComments ) and follow instructions on initial adjustment. For work with comments it is necessary to change simply project type on the Blog with comments .